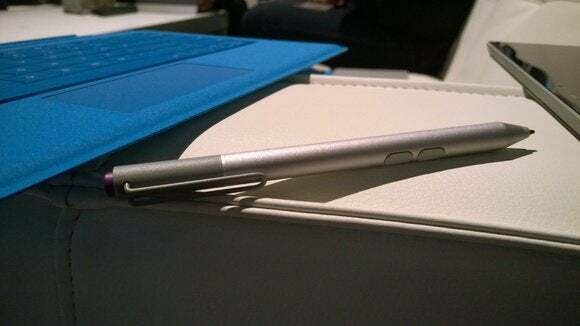 Surface head Panos Panay bounced around the stage at Microsoft’s Surface event on Tuesday, bubbling over with enthusiasm as he detailed the Surface Pro 3’s sleekness and power and fancy-pants digitizer pen. And why shouldn’t he? The Surface Pro 3 is clearly the Surface that Panay and his crew has dreamed of building ever since Microsoft decided to leap feet-first into the mobile hardware game. The Surface Pro’s guiding vision was clear ever since the original Surface Pro was announced: Powerful, PC-style productivity in a portable, tablet-style frame. But for two long and money-losing years, that vision proved so lofty that it seemed unreachable. Make no mistake: The Surface Pro and Surface Pro 2 were intriguing devices. Heck, the Pro 2 was downright enthralling. But ultimately they were devices compromised by hardware, software, and ecosystems that simply weren’t ready to support the grand Surface vision. In other words: The Surface Pro 3 is everything its predecessors simply couldn’t be. Let me explain. Chalk up Surface’s previous problems to Windows 8. As the flagship device for all that was theoretically possible with this new-look version of Windows, the Surface Pro also painted a painful reminder of just how incomplete Windows 8 was at its launch. Windows 8 wasn’t as awful as some claimed, but it certainly wasn’t appealing, and there’s no doubt it was half-formed at its release—a birth forced prematurely because Microsoft’s lengthy development cycles caught Windows flat-footed as tablets burst onto the scene. The Modern-style interface had serious usability issues. The Windows Store selection sucked. The desktop suffered from scaling issues on tiny tablet displays. Windows 8 simply wasn’t compelling, and neither was its pricey physical avatar. Sure, it was astounding that the original Surface Pro ran Photoshop without missing a beat, but it was also fat, short-lived, and saddled with Windows 8. The mad dash to play tablet catch-up created more tangible problems as well. To be frank, Intel’s processors simply weren’t ready for mobile prime time at Windows 8’s launch. The Ivy Bridge-based Core i5 processor in the heart of the original Surface Pro was designed during the laptop era. 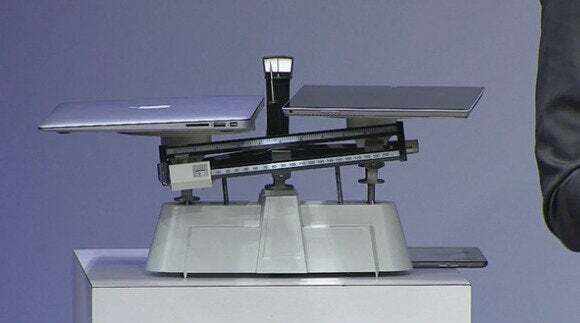 While it was technically impressive to see a tablet with Ultrabook-level performance, in the real world, power considerations made the original Surface Pro both chunky and almost appallingly short-lived. The power considerations continued to plague the Surface Pro 2, even though it was powered by a far more energy-efficient Intel Haswell processor—the very same chip architecture found in the Surface Pro 3. Microsoft kept the SP2 at the same bulky half-inch thickness as the original Surface Pro, both to allow the Surface Pro docking station accessory to work with the first- and second-generation models alike and to (successfully) use Haswell’s power-sipping chops to greatly enhance the endurance of the SP2. The Surface Pro 2 was vastly improved over the original model, but it was stuck with the first Surface Pro’s chunky physique, limiting its portability. The Surface Pro 2 needed to atone for the sins of its forefather. 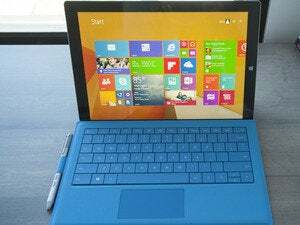 The Surface Pro 3, with its larger display and additional years under its belt, does not—and it shows. Two years after the original Surface announcement, the Surface Pro 3 is a shining example of what is possible now that Microsoft has embraced a “rapid-fire” continuous development model and hardware truly capable of supporting the Surface vision is available. Two major upgrades—the original Windows 8.1 update and the horribly named, uh, Windows 8.1 Update—overhauled the vanilla Windows 8 experience to the point that the operating system is no longer a burden to use, no matter whether you’re using the desktop or the Modern interface and Windows Store apps. Speaking of which: Apps are slowly starting to fill the shelves of the Windows Store, and yet another future update promises to allow you use those Windows Store apps in proper desktop Windows if you so choose—a boon for a device as deeply versatile as the Surface Pro 3. The Surface Pro 3 (without Type Cover) weighs more than a half-pound less than the MacBook Air. But the fruits of the rapid-fire development cycle didn’t end there. The Surface Pro 3 measures just 0.35-inch thick sans Type Cover—a hair fatter than the 0.29-inch iPad air yet far thinner than the MacBook Air’s 0.68-inch peak. The Surface Pro 3 is “the thinnest [Intel] Core product ever created,” Panay beamed during the reveal. Achieving that sleekness required building Surface Pro 3 from the ground up for Haswell, all while learning from the design mistakes of the previous Surface Pros. Panay says the Surface team redesigned the SP2’s fan to make the Surface Pro 3’s cooling system 30 percent more efficient, which minimizes bulk. (Being able to spread the heat over a larger 12-inch tablet probably didn’t hurt, either.) As a result, Microsoft offers Surface Pro 3 configurations packing top-of-the-line Core i7 processors, which never made an appearance in the first two Surface generations. 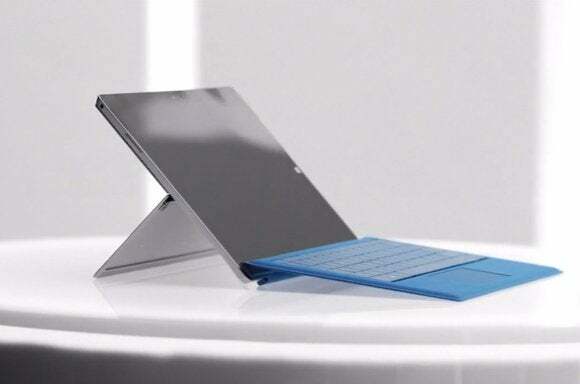 The Surface Pro 3 is almost impossibly thin and its kickstand now has a full 22- to 150-degree range of motion. Cramming a hulking Core i7 laptop-grade processor into a 0.35-inch tablet is nothing short of amazing. 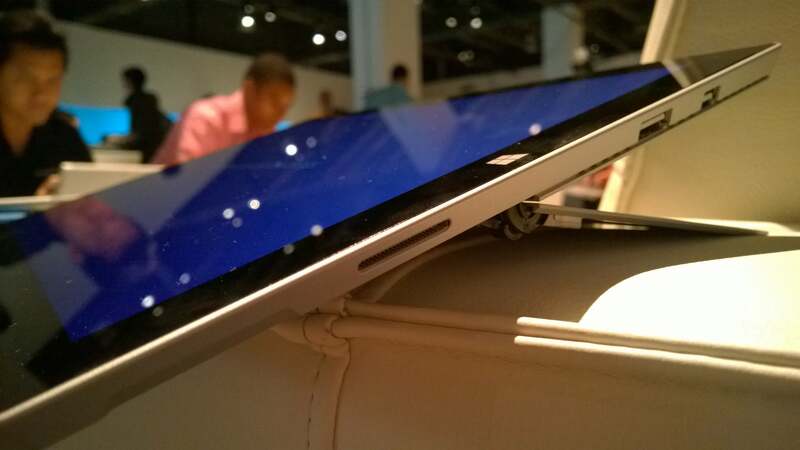 The Surface Pro 3 also features a custom, ultra-thin display stack; a vastly improved kickstand with a “full friction” hinge that lets you lean the tablet anywhere from 22 to 150 degrees, ditching the limited angle options of past Pros; a Type Cover accessory with a hinged edge to accommodate that now-variable lean and a focus on improving the trackpad experience; an included N-trig digitizer pen that deeply integrates with OneNote; and a OneNote installation that itself deeply integrates with Windows and Microsoft’s cloud services. “Every single Surface Pro 3 that comes off of the line is custom machined,” Panay crowed. The Surface Pro 3’s accessories have all been improved with thoughtful new design elements. Virtually all aspects of the Surface Pro 3 seem tailored and thoughtful, carefully crafted to marry hardware, software, and cloud in ways that simply weren’t possible with the Surface Pro and Surface Pro 2. For the first time in the Windows 8 era, the disparate parts the Surface needs to shine are all there. “This is the tablet that can replace your laptop,” Panay said in New York, and finally—finally!—he’s right. Not everyone is sold on the hybrid revolution, and time will tell if the still somewhat niche Surface Pro 3 manages more success than its forebears, but the Surface Pro 3 is truly the tablet that Microsoft always wanted the Surface to be.